Podcasts are a great way to educate yourself. Whether you’re on the train, in the car, at your desk, or anywhere in between, this medium is an incredible vehicle for supplementing your industry knowledge. Every week, I’ll be sharing episodes from some of the best marketing podcasts around, spanning the whole marketing landscape. 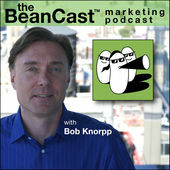 Host Bob Knorp packs an astounding number of brilliant minds into each episode of The Beancast. 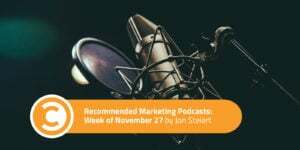 This podcast features some of the best coordination, production value, and pacing in the marketing podcast vertical. In this week’s edition, the gang discusses Net Neutrality. (If you don’t know what this means, you need to stop reading this sentence and click here—just come back when you’re done). They explore how Google is losing ground to Facebook in local search and why Gayle King had one of the best post-scandal weeks ever from a PR perspective. Takeaway: Net Neutrality is the biggest internet news item right now, despite not getting the kind of coverage it truly warrants. This impacts marketers doubly, beyond our own consumer internet usage, as it poses serious threats to how content reaches intended audiences. ISP providers insist nothing will change if legislation is amended, but only time will tell. When it comes to marketing our businesses and clients, our biggest sources of content are often our customers’ problems and reviews, according to small business expert and host John Jantsch. Takeaways: As Marcus Sheridan and Jay can attest, leveraging customer reviews (both yours and your competitors’) provides a competitive advantage. By taking feedback and repurposing it into actionable answers and advice for prospective clients, we solve problems for our audience and ourselves (new business leads!). Turning an idea into a thought-provoking piece of content is a tough but necessary process. 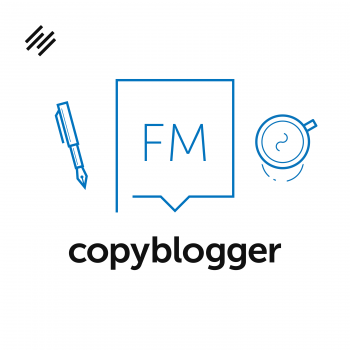 Sonia Simone, Chief Content Officer for Copyblogger, shares her simple but incredibly effective strategy for determining whether your brilliant idea is going to work for your intended audience. Takeaways: When it comes to generating content ideas, “You have to know who you want to have a conversation with,” as Sonia so poignantly points out at the 7:00 mark. Internally, make sure you or your team practices asking what your core audience wants more of, as well as what they want less of—which is perhaps even more important. 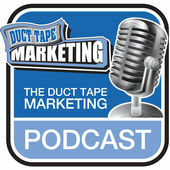 As John Jantsch points out in the Duct Tape Marketing episode above, the more niche you can get with your content, the better.